I must now talk about this recently discovered brand, Sdewhite. This brand does lots of different shirts designs using as the main element the tradition white colour shirt. 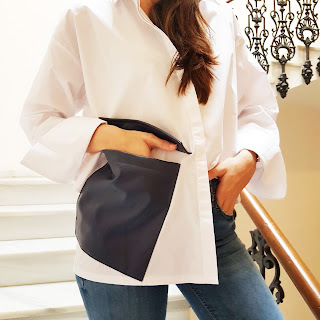 This was what attract my attention most, the sophisticate reinterpretation of the simple and traditional white shirt that this original brand does with their pieces. Here we have a nice example of one of their designs. It could look like a simple straight white shirt but is full of details that makes a big difference between this Sdewhite shirt and any other in the market. 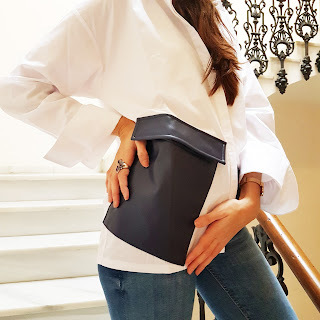 First of all, the huge blue leather-like pocket. This great touch is even nicer because instead of just leaving it straight they have rotate it a bit. A simple touch that give a touch of style. Another original part is the cuff, without buttons but with a deep cut is perfect for wearing it with a turn giving an effort less / stylish touch to any look. Wear it with heels, with shoes, with ballerinas, with trainers...is the hundred million looks shirt!